with an SSiP Registered Auditor and SSiP Scheme Accredited Assessor. SSiP acts as an “umbrella organisation” to facilitate mutually recognised Health & Safety (H&S) pre-qualification schemes, wherever practicable to do so. 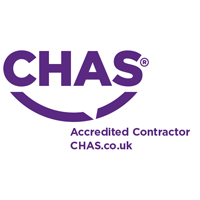 The CHAS scheme is a first stage pre-qualification scheme that allows contractors to demonstrate to potential clients that they meet H&S standards. CHAS accreditation helps to reduce unnecessary duplication and repeated applications to suppliers and contractors who require a contractor wishing to work for/with them to be SSiP accredited. e.g. Local Authorities, Principal Contractors, Universities, etc. If you require / or are interested in CHAS accreditation, or any other SSiP accreditation, we can help! While we do not guarantee a pass, we are confident that with your co-operation and commitment we will get you CHAS accredited. To-date we have a 100% client pass rate. 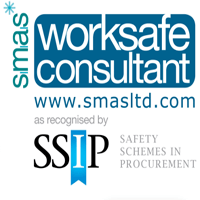 As a committment to our own continuous H&S performance, Thomas Safety Services Ltd has undergone an independent SSiP consultancy assessment with the SMAS scheme and have become a ‘worksafe consultancy’ and are CHAS accredited too. Our Managing Director has in-depth knowledge of the SSIP processes, is a registered SSiP auditor, an accredited SSiP scheme assessor and maintains a Continuing Professional Development (CPD) SSiP auditor record. If you wish to do so, you can make the application yourself using the CHAS E-Form system (* See below). The process can be lengthy and if your H&S management system is not robust, it is unlikely that you will meet the requirements of the CHAS Standards. Naturally we cannot compete on price with the remote providers and those who will offer you a ‘generic pack’, because our work is bespoke to your particular circumstances. If you are thinking about hiring a consultant who will give you a guaranteed to pass a CHAS assessments, think again, because there is no such thing as a ‘guaranteed pass’! We carry out a full review of you H&S management system and guarantee a very high standard of work. Like the majority of other H&S pre-qualification schemes, CHAS moved to an annual assessment cycle in 2012. Therefore, if you have previously been CHAS assessed, but not within the last 12 months, your CHAS status is no longer valid and has expired. Registered CHAS Buyers can check your status and this could affect your opportunities to be offered work/tender for work.